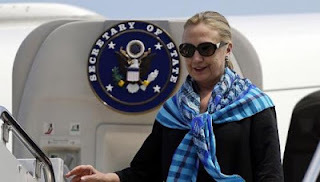 SINGAPORE (AFP) - US Secretary of State Hillary Clinton arrived in Singapore on Friday for consultations with the city-state's leaders, ahead of an Asia-Pacific summit in Cambodia with President Barack Obama. While in Singapore, Mrs Clinton will meet Prime Minister Lee Hsien Loong, Foreign Minister K. Shanmugam and elder statesman Lee Kuan Yew, the US embassy said. She will deliver a speech on Saturday on Washington's economic strategy before joining Mr Obama for the East Asia Summit in Phnom Penh. A senior US State Department official said earlier that Mrs Clinton hoped to get insights about China's new leaders from the Singaporeans, who enjoy close ties with Beijing.